Stockton started the game against a good Darlington side without goalkeeper Dylan and Fin who was still on holiday. The yellows started brightly and took the lead when Owen won the ball and played the ball out to Georgie on the left touchline he then beat the Darlington defence and finished well. Darlington then equalised against the run of play and this spurred the Yellows on who were now dominating the game but a combination of some brilliant goal keeping and some poor choices in the final third somehow meant the scores were level at the break. Stockton struggled to find the same momentum in the second half and were made to pay for not turning chances into goals when Darlington scored three good goals without reply. The yellows will learn from today and should be back to full strength next week when they face Seaton in the cup. 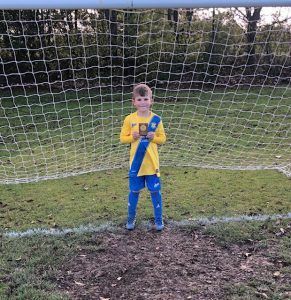 Thomas is todays player of the match who showed a great attitude and went in goal in the first half and is reward for his improvement over the last few months.